Highlights from two very different missions. Last week I played two missions from Wolfenstein 2: The New Colossus, and I killed a lot of Nazis. I’m glad to report that MachineGames is back in the developer’s chair, and those talented Swedes have taken their outlandish alternate history to absurd new levels. Our old pal B.J. Blazkowicz has gone through a lot since he first started killin’ Nazis back in 1992's Wolfenstein 3D, but this might be his toughest mission yet. Especially when you realise that he’s lost the use of his legs since we last saw him in The New Order. Battered and broken after the events of the previous game, Blazkowicz is consigned to a wheelchair in the game’s chaotic opening level. But he’s not going to let that stop him killin’ Nazis. He uses one arm to pull himself along and the other to fire a machine pistol, and it’s a wonderfully absurd set-piece. The level takes place in a submarine and sees you trundling around looking for the exit, unloading lead-based fury into waves of stormtroopers. You can also lure the unsuspecting fascists into energy fields littering the level, similar to the walls of light from the Dishonored series, that cause them to explode gruesomely on contact. As far as introductions to a game go, this is pretty special. Some of The New Order’s best moments are the tense Inglourious Basterds-inspired standoffs with suspicious Nazi officers, particularly the encounter with Frau Engel on the train. And you’ll be glad to know that these are back in Wolfenstein 2. While waiting to meet a resistance contact in a diner I find myself in an uncomfortable situation with a milkshake-slurping Nazi. He seems to have taken a sudden interest in my identity, and the giant wanted posters pasted up all over town aren’t helping matters. MachineGames are great at creating grotesque, intimidating, eccentric characters, and these nerve-racking encounters give you a chance to get up close and personal with them. The New Colossus takes its name from the sonnet engraved at the base of the Statue of Liberty, but the ‘huddled masses yearning to breathe free’ line has taken on a sinister new meaning. 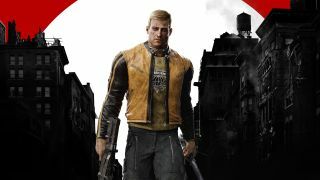 Yes, Blazkowicz is finally returning home to his beloved United States, but he won’t like what he sees. The Nazis have taken over and twisted American society to reflect its own. This is what MachineGames is calling Germericana: a romantic image of ‘60s America, perverted and corrupted by the occupiers. The collision of dreamy, idyllic Americana and fascist propaganda makes for a striking visual style, and should give our hero even more reasons to want to kill as many Nazis as humanly possible. Nowhere is the Nazi occupation of America more evident than on the sunny streets of Roswell, New Mexico. It’s like a fascist reimagining of Disneyland’s Main Street, U.S.A., with shiny Cadillacs and drive-thru diners sharing the picture-perfect streets with goose-stepping stormtroopers and Nazi flags. Before infiltrating Area 52, an underground weapons facility, you’re given the chance to explore a little of Roswell. As I wander around, disguised as a firefighter, I watch a Nazi berate a pair of hooded Ku Klux Klan members for their poor grasp of German, and overhear two soldiers speaking fearfully of the legendary ‘Terror Billy’, who just happens to be me. You may remember the Da'at Yichud Power Suit from the previous game: an armoured exoskeleton that grants the wearer incredible strength and speed. Well the good news is that, thanks to his injuries, Blazkowicz gets to wear it in The New Colossus. But it’s a blessing and a curse. It makes him sprint at a remarkable speed and increases the power of his melee attacks, but his health is cursed never to rise above 50. You can overcharge it briefly by picking up aid items, but it’ll always trickle back down. At least until you unlock upgrades later in the game. The dramatically increased running speed came in handy whenever I had to break away from a firefight to go scoop up some ammo. Blazkowicz is in Roswell looking for access to an underground railway that’ll take him to Area 52. And it’s here where I get my first taste of Wolfenstein 2’s regular, non-wheelchair-based combat. And it’s business as usual, in a good way. The level is a big industrial maze of catwalks, crawl-spaces, and corridors, with scope for sneaking and stabbing as well as shooting. The Nazi-killin’ hasn’t changed much since The New Order, honestly, so this is a refinement more than a reinvention. Which, when you consider how good the previous game was, is no big deal. The combat is weighty and fast-paced, and mowing down fascists with big, loud guns is still brutally cathartic. Fancy some more Wolfenstein 2 reading? Check out Shaun's hands-on impressions.